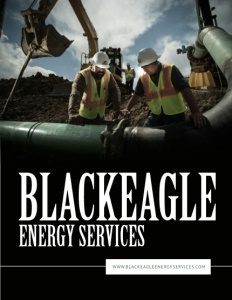 Business View Magazine interviews Todd Erickson, VP for Corporate Development at Black Eagle Energy Services as part of our series on the pipeline industry. BVM: Todd, can you speak a little about the origin of Black Eagle Services and its continuing evolution? Erickson: “The Company was started about 30 years ago, here in Berthoud, Colorado, by a father and two sons who were welders. They started with a fabrication shop, fabricating things for the oil and gas industry – launchers and receivers for pipeline, as well as pressure vessels. After doing that for a short time, they saw that there was also an opportunity in pipeline construction and they expanded into that, as well. “About ten years ago, the company changed ownership from that family-owned business; an equity company bought it and combined it with several other businesses. Then, Desco Corporation, the current owner, bought that company in 2011. Desco is a Columbus, Ohio-based family office that has been buying and operating companies since the mid-‘60s. “After Desco bought the company, they saw that there was an opportunity to upgrade the management to a more professional organization, and they brought in a new team shortly thereafter. Since then, the company has grown substantially; it’s over three times the size it was when Desco acquired it. BVM: What are the company’s main areas of expertise and who are its main customers? Erickson: “We construct and maintain energy infrastructure – primarily pipelines for natural gas and refined products, and the associated pumping and compression facilities that go with those pipelines. We also have a fabrication facility that supports these activities; it meets manufacturing code standards for building high-pressure vessels and pipeline accessories, like launchers and receivers for our customers in the industry. “We work in three market segments. The first is midstream oil and gas. That’s the gathering and transportation of oil and gas from operators; the second is refined products transmission. The refineries across the country typically transport product in pipelines to terminals for distribution. We build and maintain those pipelines and terminals. The third area is something that we’ve expanded quite a bit lately – natural gas utilities; that’s the transmission and distribution of natural gas to end customers. BVM: How do you differentiate your company from the competition? Erickson: “In a word, we characterize our strategy to differentiate ourselves as ‘professionalism.’ It starts with our sophisticated performance management system. Every crew on every job gets a scorecard every week. We also share scorecards with our major customers on our projects, so they, on a weekly basis, have some kind of accounting of where we are in three areas: safety, efficiency, and quality. We have a pretty sophisticated data management system. It records real-time data on safety, efficiency, and quality; we analyze and interpreted the data, and then report it back to the crews. So, everybody knows where they stand on their projects all the time. We find that, by keeping score in this way, and providing this kind of feedback, our crews perform much better and more safely than other companies of our size. BVM: Anything new and newsworthy on Blackeagle’s current agenda? BVM: Over the last several years, pipelines have become a bit of a political football, a symbol, if you will, of the tensions between the fossil fuel sector and those who fear pollution from leaks. What’s your take on the issue? “Our industry is very sensitive to its environmental image, and our performance in this area is why many of our customers choose us for their sensitive environmental jobs. Taking care of the environment and the public is part of our performance management system, which requires daily planning on every crew to mitigate environmental impacts and track any and all environmental incidents. The environmental impact is very highly scrutinized and the scorecard system that I discussed earlier has environmental criteria as part of that safety measure. Again, we set standards and see how we’re doing and report it back out on a weekly basis. And we found that this has helped us manage our environmental impact, and our safety, as well, on these projects. “Recently, we were chosen for two environmentally sensitive projects with high public visibility. Both of these projects took place in Colorado resort towns, and our customers wanted assurance that the highest standards would be met. They chose Blackeagle for both these projects, despite the fact that we were not the low bidder on either. They wanted us because they trusted Blackeagle based on its past experiences. And both were delivered on time and on budget, with minimal environmental or public impact. BVM: What’s next for Blackeagle? Erickson: “The success that we’ve had with our strategy of professionalism, and by setting those standards and measuring ourselves against them, has proven to be the correct strategy. So, we’re going to keep doing more of that. We also think integrity management with utilities and refined products transmission is a great growth area because of all the scrutiny on pipeline integrity. 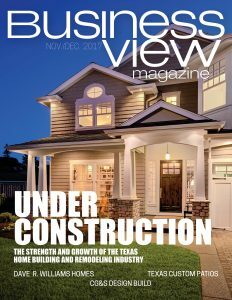 “We’re also expanding into the Texas market – there’s a lot of activity in west Texas. We think that there is an opportunity to expand our market share where the oil and gas industry has been stepping up its capital expenditure on infrastructure; and also in our eastern region, where the utility industry has extensive plans to replace and upgrade much of the existing natural gas distribution network. “Right now, we’re at world-class levels in performance safety. We recently were the recipient of the Distribution Contractors Association Arthur T. Everham Award. They award the highest performing companies in safety in the utility industry. So, we plan to maintain our position as the very best among safe companies in our industry. Check out this handpicked feature on Teel Plastics – Taking on the challenges.